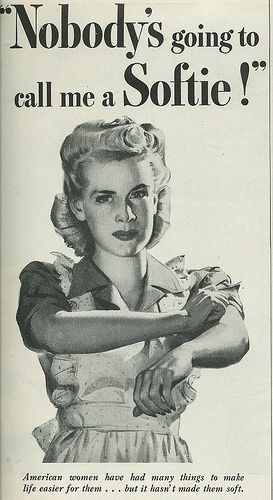 [HOME JOURNAL] - A National TLC Service initiative to advance investigation of the domestic remains of war-making in/on the homefront—our literal homes! 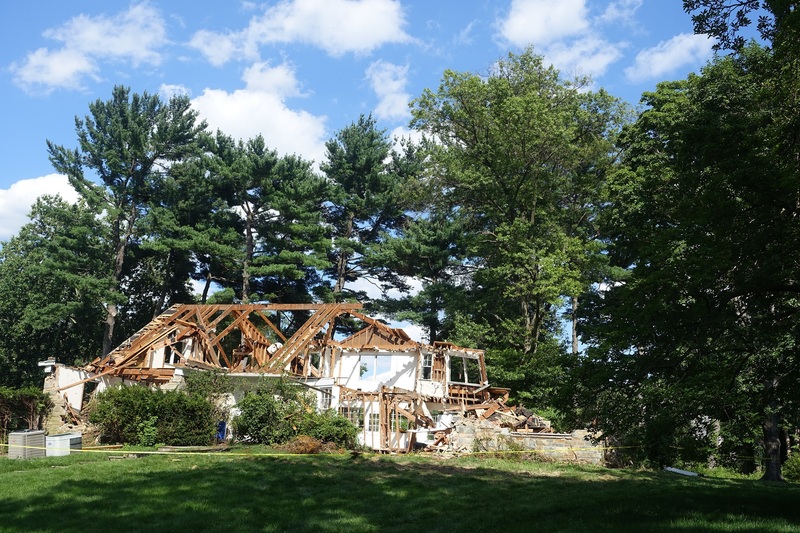 The National TLC Service call for homegrown reflections on the ways the Cold War shapes our everyday lives (as well as the need for a good housecleaning) galvanized the sudden decision to demolish my kitchen and rebuild it. The effort hinged around a set of mid-century kitchen cabinets that I had reclaimed from a community salvage yard. My salvaged Cold War kitchen cabinets were beautiful: boomerang chrome pulls, cleverly designed metal-lined bins and racks, an impressive sliding built-in silverware drawer, and seriously sturdy yet elegant overall construction and fixtures. They were custom-made—the kind featured in Cold War kitchens of the future, which showcased American ideologies of democracy and military superiority wedded to the white heteronormative suburban family. I intersected with the cabinetry’s afterlife at the salvage yard tucked away behind a heap of cupboards from the Watergate hotel that were so shoddy the particleboard seemed to crumble to the touch. 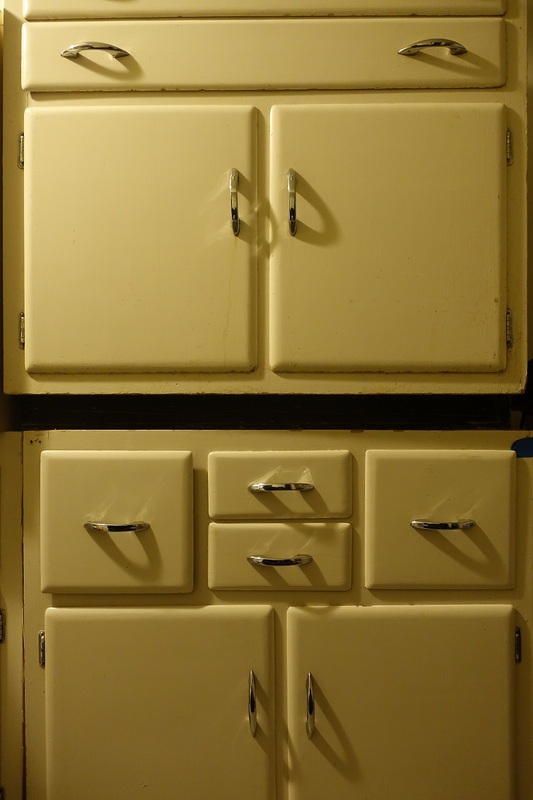 While extricating the 1960s-era cabinets from the other displaced kitchen sets, I observed several large stickers on the back that still displayed the cabinets’ original purpose: they had been designed and installed at a residence in the Northwest quadrant of DC. I jotted down the address and then quickly made my purchase and returned home, with the plan of picking up the cabinets on a later day when I could rent a truck. 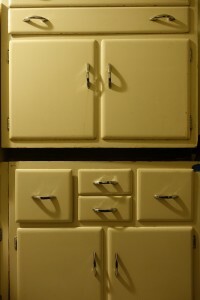 In the time between my initial trip and my return to the salvage yard, I discovered that the kitchen cabinets were not mere atomic kitsch: they originated from one of the wealthiest neighborhoods of Washington, DC—the same land that was also the birthplace and experimental test site of the U.S. chemical weapons program. 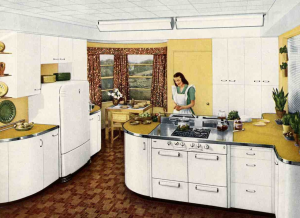 The cabinets were from a home located in the upper right corner of the 660-acre Spring Valley Formerly Used Defense Site (FUDS) near American University (AU). 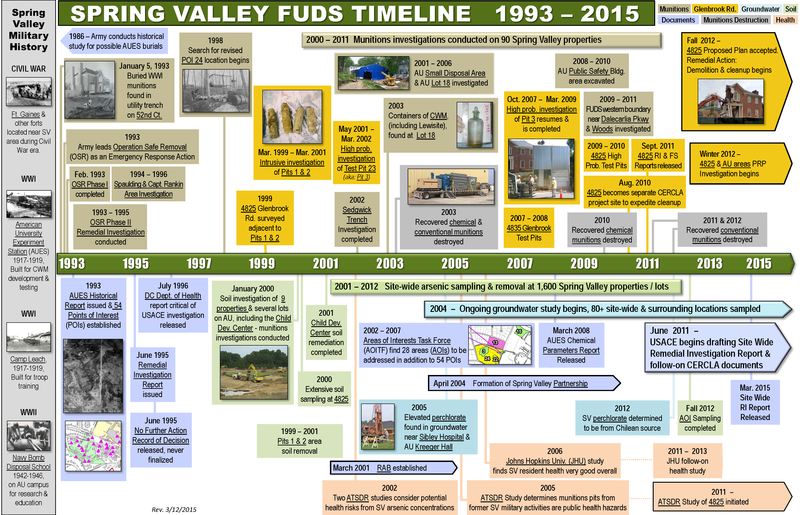 The FUDS program was established by the Department of Defense (DOD) in the 1980s to environmentally restore inactive facilities under DOD jurisdiction; most FUDS are relics of the Cold War, WWII, WWI, and in some cases the Civil War. 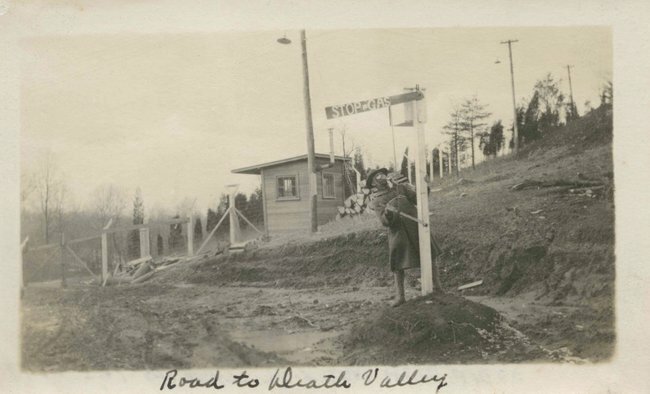 The Spring Valley FUDS designated an area that had hosted the U.S.’s principle research division and testing station for poisonous gases and chemical munitions developed for America’s entry into WWI. American University had only been open a few years when the U.S. declared war on Germany in 1917, prompting the board of trustees to offer the U.S. Government the use of the campus to support the war effort. 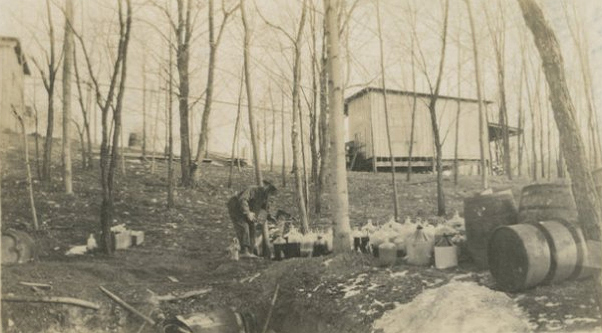 The U.S. Army Corps of Engineers (USACE) eventually established Camp Leach on the campus, and the newly-created Gas Service (later the Chemical Warfare Service) and Department of Interior Bureau of Mines founded the American University Experiment Station. Utilizing over 150 buildings with around 1900 uniformed and civilian personnel, the U.S. chemical weapons program outfitted the campus and surrounding land with underground concrete pits, trenches, and open ranges for field tests of chemical munitions and lethal materials, including mustard gas, lewisite, ricin, cyanogen, chloride, phosgene, chlorine, cyanide, and more. 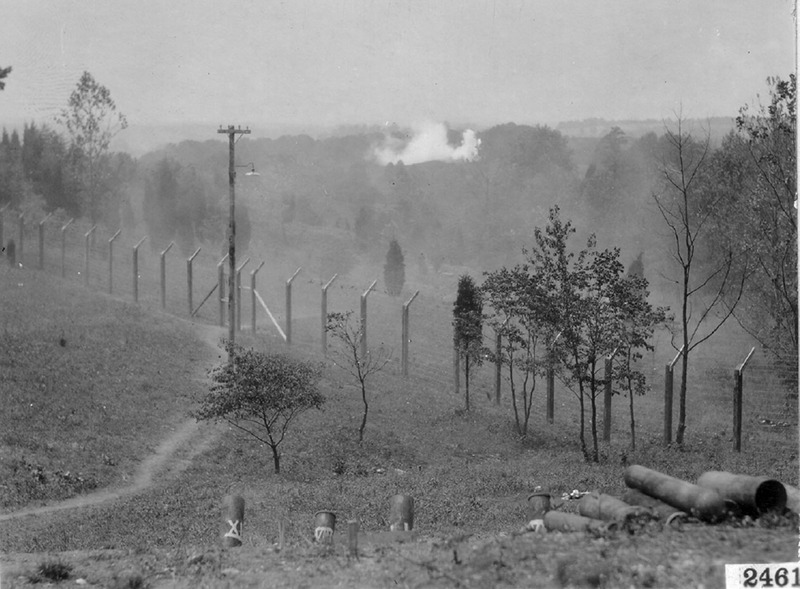 After the war, the Army returned land to AU along with a new sewer and water system; the farmland to the northwest of AU, where munitions had been tested and dumped, was purchased by W.C. & A.N. 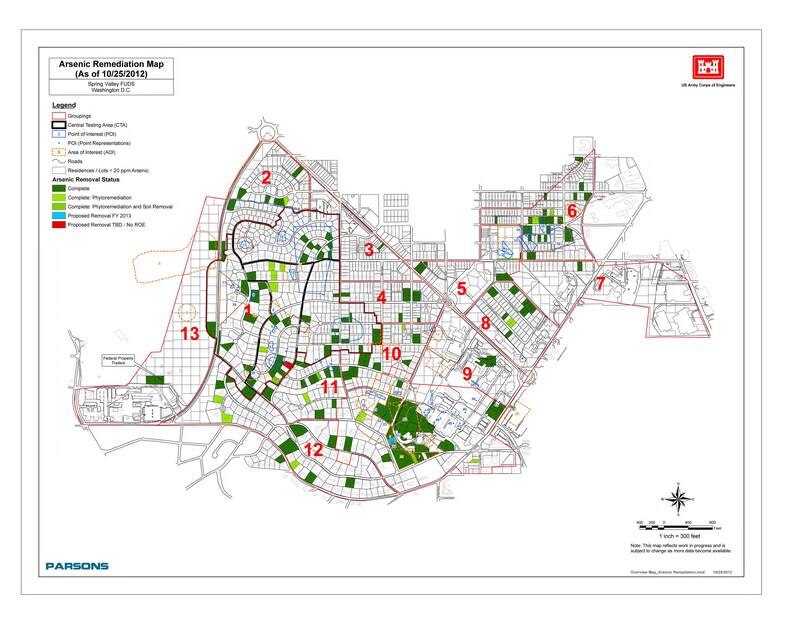 Miller Development Company for the growth of an upscale neighborhood. What soldiers had nicknamed “Death Valley” became the prestigious DC bedroom community of “Spring Valley,” known for its high-end custom-built homes and twisting street design that departed from DC’s grid system. Using more exact mapping and photographic analysis techniques than in previous investigations, the search for a “hole called Hades” led the USACE to the backyard garden of the private residence of the South Korean ambassador and the mansion next door, where over 680 items associated with chemical munitions were eventually found on the grounds. 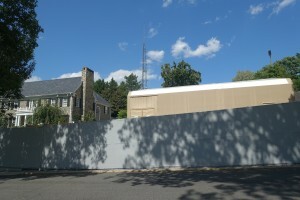 While the South Korean ambassador home remains, a large aluminum-plated structure, built to withstand munitions blasts and to contain and filter poisonous vapors, now resides at 4825 Glenbrook Road; the large red-brick mansion that once stood on the property was demolished in 2012. As excavations continue, a large tent in front of the metal building conceals workers in hazmat suits and breathing equipment. In 2010 workers found a vial of arsenic trichloride—known as “arsenic butter”—a compound that was used to boost the lethality of the blistering agent mustard gas (reportedly responsible for more than one million casualties in WWI) and to produce lewisite, nicknamed the “dew of death” (it is said to emit the odor of geraniums). 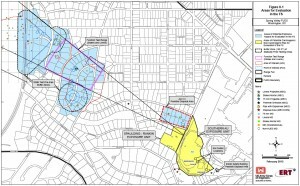 More than 1,000 munitions and 44,000 tons of contaminated dirt and debris have been excavated and removed throughout the Spring Valley FUDS, rendering a “fan pattern” of munitions debris emanating from the former AU testing station that cuts through the winding streets of manicured lawns and purple azaleas. The cleanup of this former test kitchen of the Chemical Warfare Service continues today, with cost estimates ranging from $90 to $180 million. What would you do with Cold War-era cabinets from a well-to-do residential Superfund site of WWI chemical weapons of mass destruction located less than five miles from the White House? How was I to know whether the cabinets warranted concern beyond my fascination with their bizarre toxic provenance? Did these cabinets constitute an environmental risk and health hazard as the centerpiece of my kitchen remodeling schemes? Did I really want to invite Spring Valley/Death Valley into my home? 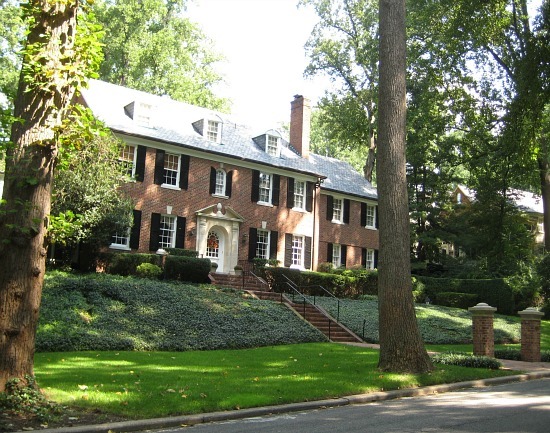 A panoply of famous figures have allegedly lived within the Spring Valley 20016 zip code: U.S. attorney generals, senators, the principal owners of the Washington Nationals, army generals, media personalities, ambassadors, an AU President, a number of famous DC socialites (ex. Perle Mesta, known for her parties and DC housewarming advice—“hang a lamb chop in the window”), and a handful of former U.S. Vice Presidents and Presidents, such as Lyndon B. Johnson (after becoming the Vice President for JFK) and George W. Bush (whose former home is now the residence of the ambassador of Algeria). The cabinets hailed from a house that was more modest and middle-class in the Spring Valley social periphery and was, therefore, more removed from earlier Death Valley chemical munitions activity. However, the address belonged to an area of land that exhibited elevated levels of concentrated arsenic (43 parts per million according to USACE “arsenic exceedance” maps). 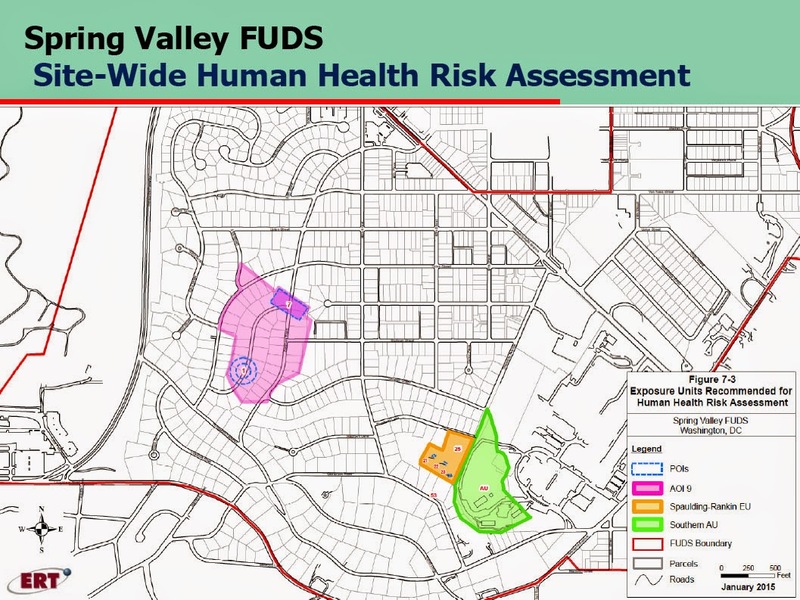 The USACE had conducted chemical analysis of an ever-widening zone of Spring Valley and AU soil, in part to track down the extent of arsenic contamination. The threshold of “safe” arsenic levels was unclear, and many residents argued that backyard testing was not enough: household dust could originate from contaminated yard soil brought into the home, especially through the kitchen. In the end, I chose to bring the cabinets home by following a procedure that loosely mimicked the USACE Spring Valley FUDS cleanup; I also implemented basic OSHA and DC Department of Health suggestions for handling surfaces with potential arsenic contamination from gardening soil or other sources. 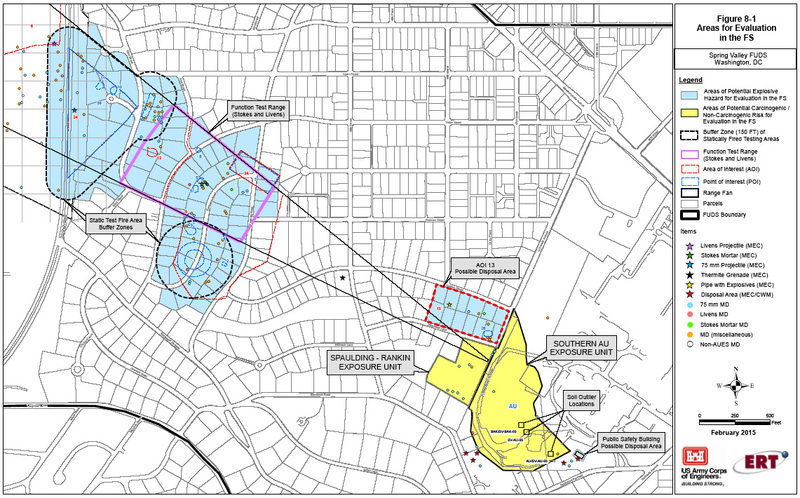 Chemical weapons and contaminated soil that had been removed from Spring Valley were sent to a nearby staging area on a piece of federal property along the Delacarlia Parkway (a site close to Sibley Memorial Hospital, ironically). There, WWI debris was either destroyed or repackaged for disposal elsewhere (chemical weapons were flown by military helicopter to Andrews Air Force Base and then on to Pine Bluff Arsenal in Arkansas). Similarly, I spritzed the cabinets with water at the salvage yard, to keep down dust, and transported them in tarps to my side yard (slightly down the hill from my house), which served as my own preparation ground. At this staging area, I donned gloves, rubber boots, and a dust mask, sprayed the cabinets, and wiped them down, before bringing them first into my basement. My reasoning behind this procedure spiraled into crisis at one point: even the water I was using to clean the cabinets was not entirely disconnected from Spring Valley. Chemical analysis of groundwater monitoring wells near the Washington Aqueduct and Delacarlia Reservoir (located adjacent to Spring Valley) in the 2000s indicated elevated levels of perchlorate, a compound that was used in tests with mustard agent and screening smokes. The Delacarlia Reservoir, adjacent to Spring Valley, serves as a primary sedimentation and storage basin for water in the Washington Aqueduct system. One of the first major aqueduct projects in the country and commissioned by Congress in 1852, the Washington Aqueduct provides the public water supply to approximately one million people living, working, or visiting the District of Columbia, Arlington County, Virginia, and the City of Falls Church, Virginia. This includes me—whether located at my house or at work on the Georgetown campus. No Spring Valley residents use groundwater for drinking, cooking, or bathing, but perchlorate (and other toxins from Death Valley) may come to harm the vital water infrastructure of all of DC. The USACE, which administers the aqueduct and reservoir, continues to screen for drifting WWI residues. The real or imagined possibility that my tap water might carry perchlorate threatened the effectiveness of the cleanup strategy I had selected to eliminate the unknown arsenic dust from my kitchen set. I ultimately decided to monitor my doubts about DC water indefinitely: it’s not likely that a few parts per billion of perchlorate in the water would have been any more dangerous than if I had used Windex or other common household cleaners to conduct the kitchen cabinet remediation. The residues and historical geographies of war are intimately connected to everyday life. My salvaged cabinets are one literal example of habitation with the remains of war; there are numerous other manifestations that are not obvious: pesticides and herbicides, the constant reuse of sites regardless of uncertainties of what lies beneath, the radioactive dot of americium in your smoke detector, the scientific-technical management and domestication of waste, or the after-effects of uneven investments in the suburbs versus inner cities. My Cold War kitchen cabinets are part of the multiply-scaled, domestic and ordinary dissemination of the nation’s chemical warfront, from the original paint of the cabinets—the fruit of the chemical industry—to their commissioning for a home that became complicit in hiding a WWI chemical weapons dump in plain (suburban) sight—to the not-proven presence of arsenic-laced household dust that may have traveled through and accumulated in moving vans, the salvage yard, worker’s gloves, the land around my house, my food and bloodstream. Salvaging the cabinets took me on a journey of uncertainty about the material organization of my home in relation to war; basically, my kitchen reconstruction launched a materials-oriented genealogy of chemical warfare. House repairs, for me, are an opportunity for re-use and what I would now advocate as banal curiosity about “toxic provenance.” Self-conducted/managed house repair can serve as a means to render the chemical and radioactive legacies of war that permeate everyday life. And while more uncertainty, not less, about the safety of one’s dwelling is inevitably the result (our buildings are made with, comprised of, and covered in potentially harmful substances—expanding the meaning of “sick building syndrome”)—this more grounded understanding of risk and uncertainty advances analytic connections between the home as a military space, regional economies, a defense materials complex (an earlier name for the U.S. weapons complex), American exceptionalism and war. The “toxic know-how” that comes with house repair can help adjudicate how to dwell in/with the uncertain remains of war—not so much in terms of neoliberal resilience of the homeowner but as a potential catalyst for social-action research into the embodied life of war on the homefront. Tracking the toxic contexts of salvaged materials is difficult work. In a simultaneously sincere and somewhat comedic manner, I attempted to play the responsible consumer who makes an effort to figure out where something is from—which in this case led me from my kitchen all the way to the U.S.’s chemical weapons ground zero (admittedly, only a few miles away). The toxic provenance of my kitchen cabinets shows that there is nothing exceptional about material linkages to war—even while the story of my cabinet connections to Spring Valley/Death Valley unfolded in the most absurd way! In simply doing house repairs, I have become terribly aware of the hazardous chemical materials that are applied to and embedded in modern construction and homes: vinyl, the latex in paint, construction adhesives, epoxy, asphalt, caulk and other sealants, varnishes, various solvents, PVC plumbing resin, oriented strandboard in general and the pesticides incorporated in “greenboard” pressure-treated lumber, to name a few. These toxic materials are generally contained in construction (they undergo “tolerance” tests and so forth), but they can be seriously dangerous to anyone working with them. House repairs make you aware of their contradictorily indispensable yet hazardous presence to workers in/on the home—and in this case, the salvage yard, where I have subsequently advocated for practical applications of toxic provenance as part of occupational safety in the second-hand economy. By undertaking home repairs, one’s participation with these materials prompts new understandings of harm (across bodies of land, human bodies, buildings) and opportunities to imagine and practice an alternative “material public” beyond privatized security and threat. My home repairs initiated a kind of demilitarizing effort—a kitchen counter-reality—by excavating the military-industrial complex in the home and vice versa. As a figure the cabinets queer home security: the promiscuity of household dust or ordinary tap water, from chemical weapons dump to kitchen countertop, exposes commonplace assumptions that the home, the individual, city infrastructure, the university, nation’s capital, and so forth are autonomous, unitary, or singular defensible sites. Instead we see an unevenly manifested toxic commons with uncertain harms ricocheting across and between scales (body, housing development, municipality, region, salvage yard, home, etc.). We also see that my affinity for the cabinets and salvaging them for my home became a way for me to practice kitchen demolition/restoration (rather than criticism or policy) as a means of changing the material conditions in which military pollution remains hegemonic yet largely unintelligible in the area where I live. Toxic genealogy of my Cold War cabinets has delineated the deep layers of military ecology, attendant to America’s early chemical weapons program. As my companion and guide through Spring Valley to Death Valley, the cabinets invite uncertain revelations about the secretions of WWI-era chemical weapons in the nation’s capital, and the governing function of “sacrifice” and “resilience” in response to toxic crisis. In this case, resilience can take the form of residents attaining property tax breaks due to the potential presence of buried backyard mustard gas and chemical munitions. Home prices start at $1 million and climb to $5million, regardless of the ongoing USACE cleanup, off-and-on evacuations, and uncertain health risks. The disavowal of war’s harmful impacts is in some sense maintained through the preservation of white privilege of this wealthy Northwest-quadrant enclave; its good schools, high property values, and beautiful landscape entail exposures to unprecedented everyday risks, material hazards, disease, and death. The upkeep of the pastoral scenery is not without its discontents: there have been several civil suits brought against the Federal Government, U.S. Army, USACE, and AU (none successful except for one out-of-court settlement), local outcry over the egregious lack of information provided by the USACE, and local health polling that refutes the “no finding” of adverse health impacts on the part of the USACE. 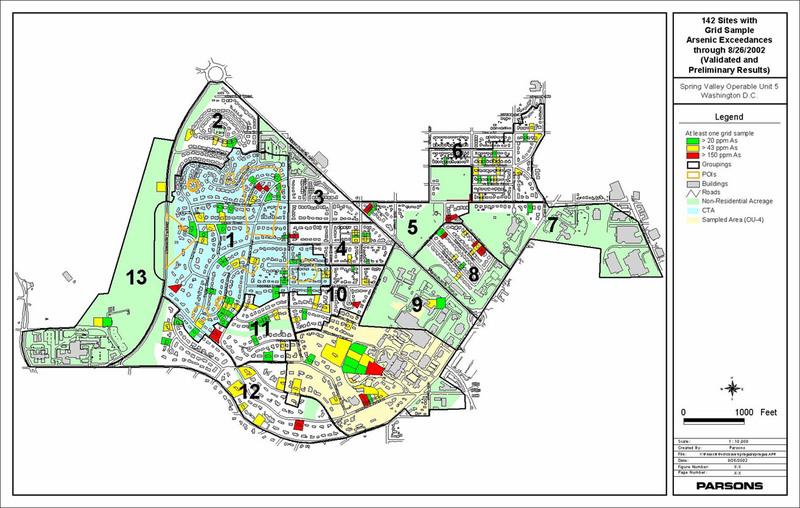 Spring Valley/Death Valley—the articulation of white enclave to the nation’s first chemical weapons experiment station and proving ground—requires further excavation within metropolitan DC’s regionally racialized layout, infrastructure, and epidemiology. The case also troubles certain conventions of eco-criticism and environmental justice in response to toxicity, such as melodramatic cause or lack of choice. In most popular accounts, Spring Valley is presented as an enigmatic and curious place rather than a community of suffering on par with a contaminated inner-city or periphery. 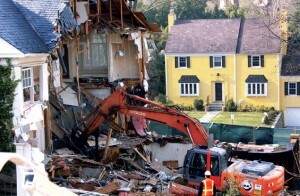 Benefitting from the amenities of a well-off protected DC residential community, Spring Valley subjects are troubling environmental subjects: they do not adequately demonstrate lack of choice or inequity borne through embodied sacrifice, thus deflecting rather than rousing sympathy. 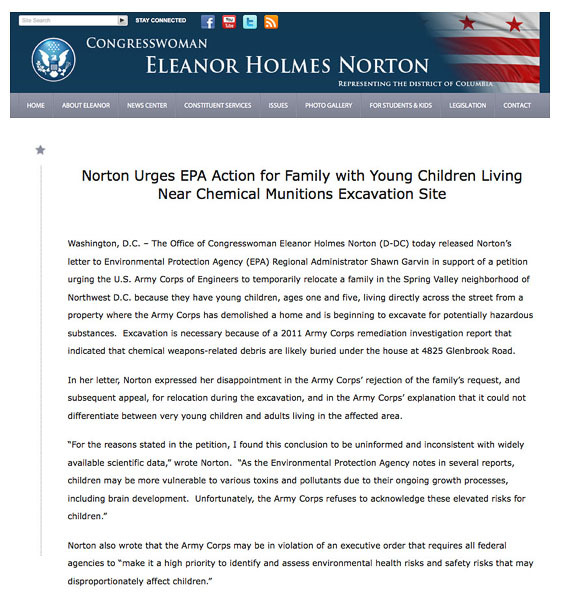 In Spring Valley, even the children of the wealthy only marginally occupy the position of victims: the USACE has refused to acknowledge elevated risks for children (the susceptibilities of adults and the young are treated the same) and denied requests for the relocation of children who live in a house on property that is undergoing remediation (one wonders if the underlying assumption is that wealthy families can afford/should pay for the transfer?). The resilience of Spring Valley continues to play out as a tragedy of intergenerational justice. 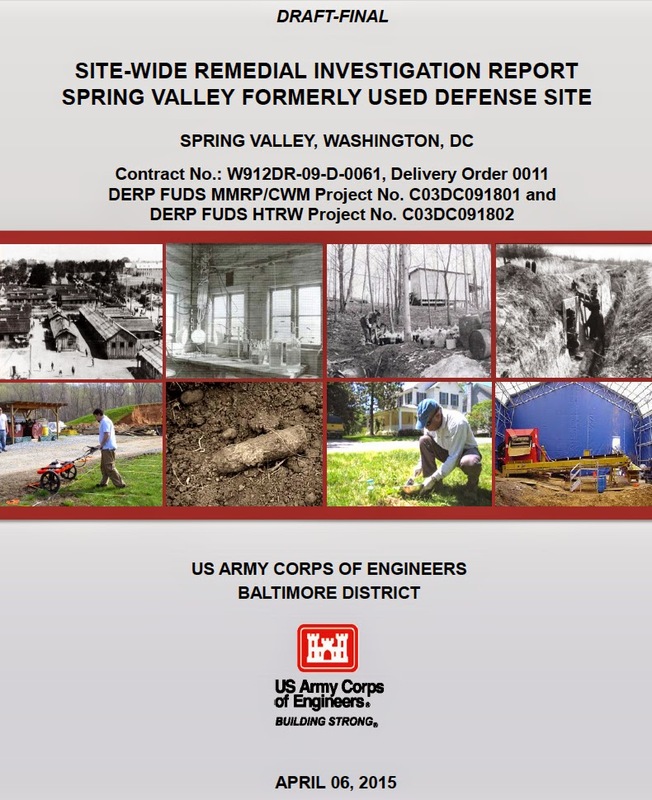 Tort-inspired legal controversies over Spring Valley have revealed that USACE and AU didn’t disclose information about contamination and hazards in the 1980s, and, after two phases of Operation Safe Removal in the 1990s, the USACE again turned away from evidence that there were additional munitions trenches in the area. 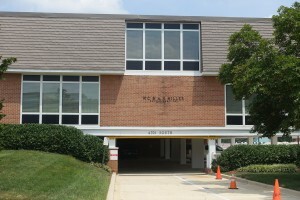 Legal proceedings also uncovered that the U.S. Department of Agriculture had also operated a laboratory on the AU campus for the development of pesticides and herbicides between 1919 and 1945; signs of this had been found during private sales and real estate development (herbicide-contaminated soil and a 55-gallon drum) but not revealed to the public. When cleanup operations began, the focus was exclusively on locating munitions rather than chemicals, and initial health studies failed to include chemicals that would be the result of degraded chemical weapons. It was not until heavy concentrations of arsenic were found in the soil of AU’s Child Redevelopment Center when arsenic contamination of the soil demanded attention, leading to widespread testing and remediation of soil throughout the neighborhood. Every step of the way, uncertainty has been the rationale for not taking further action; this played out in connection to the desire, on the part of various players, to maintain and/or avoid challenging property values. 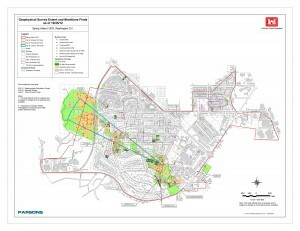 When the Miller real estate company filed an administrative tort claim seeking $15 million in damages, the Army rebuffed the claim by stating it had no legal or regulatory requirement historically to disclose information because the presence of chemical weapons in Spring Valley could not be conclusively determined. Seeing through the underlying agenda of this move to sanction Army irresponsibility, a small group of citizens from the Spring Valley Residents Advisory Board at one point organized National-Archives-based research on the chemical legacies of Spring Valley that was more effective than the USACE’s so-called investigation and, thus, pressed the search further. USACE’s actions are not all that surprising given its budget constraints: most funds go toward cleaning and closing bases—not remediating them. 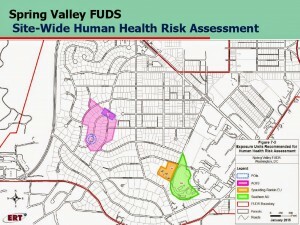 Given the high-profile status of this particular neighborhood and its location in DC, the Spring Valley FUDS commands a large percentage of the small pot of money earmarked for the national FUDS program and nearly all of the region’s FUDS money. The estimated costs of the Spring Valley cleanup have escalated over 600%, from early figures like $20 million up to anywhere between $125 and $180 million. Spring Valley is therefore both a singular case—it is the first known residential FUDS involving chemical weapons—but also a more generalizable and cautionary tale in the context of federal-level Base Realignment and Closure (BRAC) plans to decommission numerous sites across the country and restructure DOD priorities. Exploring the toxic provenance of Cold War cabinets has absurdly connected me to myriad other salvagers of military remains that are positioned very differently: yard workers exposed to military-related items; the South Korean ambassador; Spring Valley residents who demolish their mansions through a salvage process that accrues them tax breaks; and even the USACE, which is the domestic real estate & interior re-use arm of the DOD. My house repairs have led me to consider uncertain material linkages between cabinet dust and the U.S.’s first poison gas facility, Spring Valley residents’ struggle for information, and the ongoing U.S. military restructuring and its impact on local neighborhoods and regional economies. 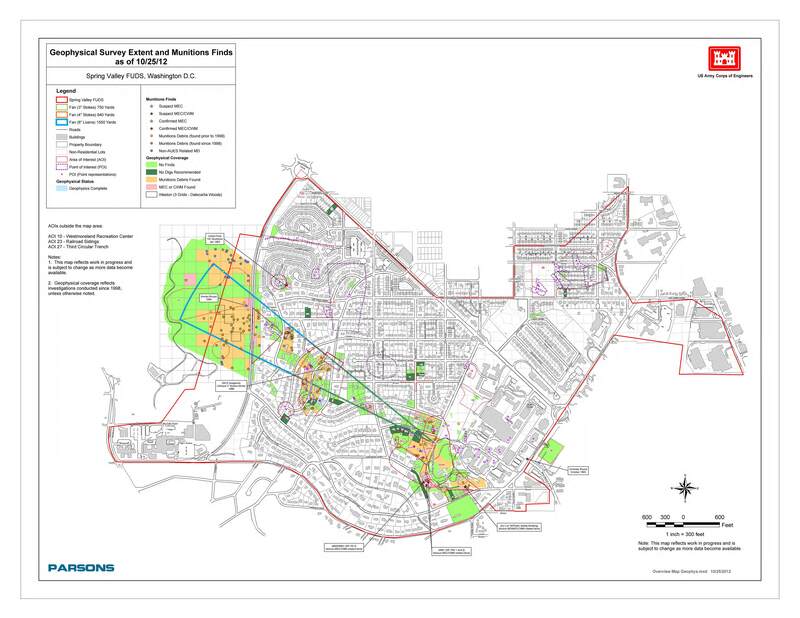 Very close to Spring Valley on Sangamore Road and MacArthur Boulevard, a massive $300 million renovation project is underway, following the BRAC closure of a 40-acre site that formerly housed the National Geospatial Intelligence Agency. The government mapping agency, which had been located there since the 1940s to interpret spy satellite imagery and build high-tech digital maps, vacated the premises and moved to Fort Belvoir in Northern Virginia upon BRAC orders. The Pentagon earmarked the area for re-use as a hub of various intelligence-gathering agencies that are yet to be (if ever) fully known by the public. 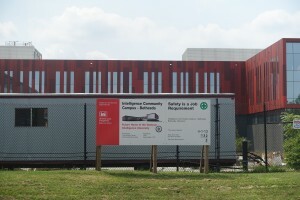 The development of this Intelligence Community center—a real estate project convened between the USACE and the Defense Intelligence Agency—has transformed the mostly windowless red brick building into a gleaming new complex that is projected to house as many as 3000 employees. 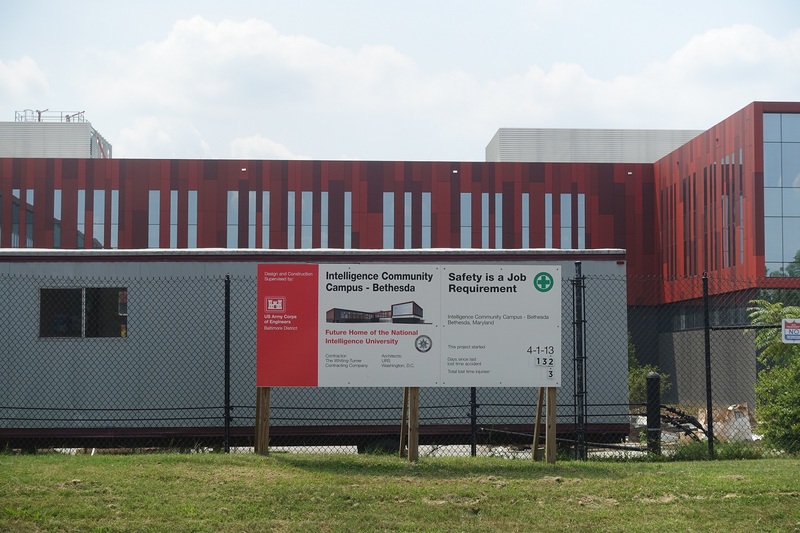 A large sign staked at the site announces: “Future Home of the National Intelligence University.” Directly across the street from this new Intelligence Community Campus sits the main office of W.C. & A.N. 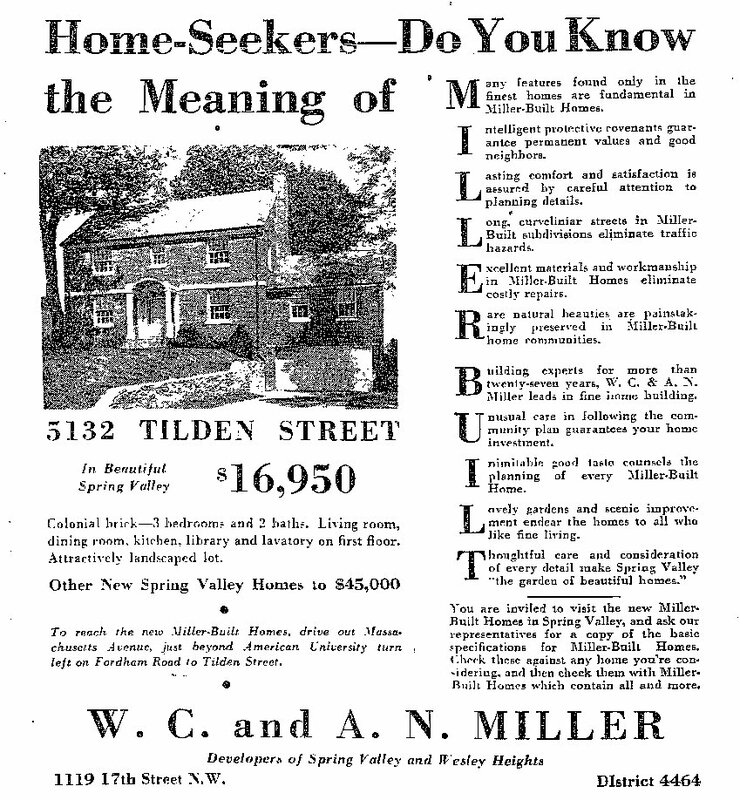 Miller Development Company, which, regardless of claims to have separated from the original business that developed Spring Valley, still advertises on the outside of its building that it was founded in 1912, just prior to the outbreak of WWI and, later, the establishment of the American University Experiment Station and Camp Leach. The absurdity of this convergence speaks to the ongoing, ineluctable “before- and aftermath” of repurposing for war. But this finding also shows that even one’s ordinary kitchen can help to render the domestic warfront more intelligible as the basis for alternative salvage-based coalitions and political action. A huge part of the impulse was that my kitchen was structurally unsound and hideous. It featured brown-blue formica countertops that were peeling and regularly puncturing clothing and skin, dirty-white ceramic floor tiles that had been sealed before a good cleaning, and a refrigerator cubby-hole sectioned off from the room that, as I later discovered, was about to fall off the back of the house from termite damage to the subfloor and exterior wall. 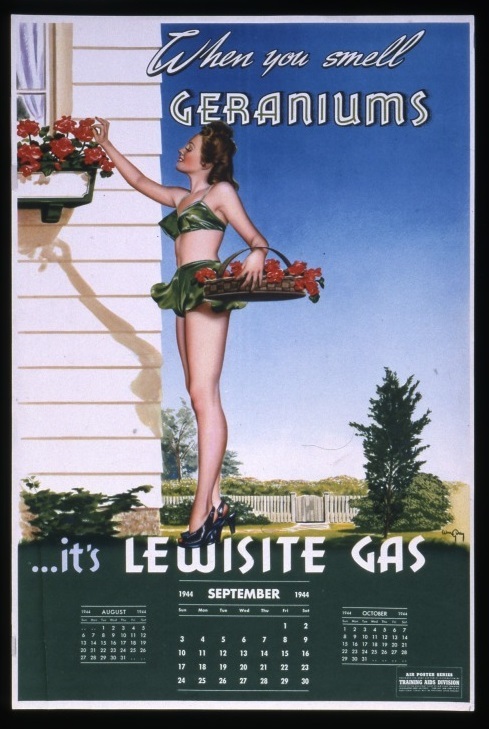 Arsenic is naturally occurring but also a component of lewisite. Average listing prices for Spring Valley can be found on Trulia: http://www.trulia.com/real_estate/Spring_Valley-Washington/1895/. The figures included here are dated from August 15, 2015. There have been five civil suits; several suits were folded into these five. The most “promising” suit involved the real estate company W.C. and A.N. 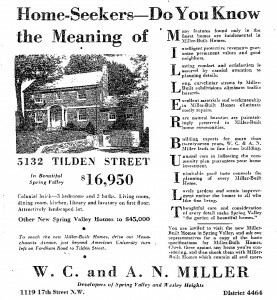 Miller, the organization that had developed Spring Valley, but it never went to trial. The parties settled in 1998: the Federal Government agreed to pay Miller $2.1 million. See: James W. Moeller, “Arsenic and Old Base: Legal Issues Associated with the Environmental Restoration of Defense Sites in Washington, D.C., Used for the Development and Disposal of World War I Chemical Munitions,” Catholic University Law Review 54.3(2005): 879-959. For example, the blog “Weapons of Mass Destruction in DC” (Allen Hengst) provides a wealth of archival information, rigorous photo-documentation, and a comprehensive overview with running commentary about Spring Valley/Death Valley politics. 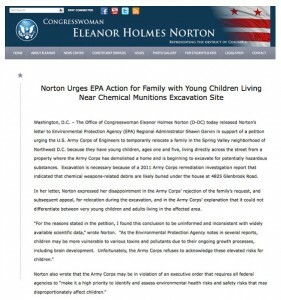 Refer to: Marguerite E. McLamb, “From Spring Valley to Death Valley: A Case Study of Contamination in Washington, D.C.” Sustainable Development Law and Policy 3.1 (Fall 2003): 3-9, 6-25, http://digitalcommons.wcl.american.edu/cgi/viewcontent.cgi?article=1390&context=sdlp.